Barrie is located right along the shore of Lake Simcoe, at the tip northern tip of the Golden Horseshoe. With a population of around 135,000 residents, it’s the 34th largest city in Canada. It’s also one of the most fastest growing communities in Canada as well. Given the close proximity of Barrie to Toronto, along with the affordability of the community and easy going life style, it’s no wonder why Barrie is such a popular choice. Goldfinger Law is proud to serve Barrie and the surrounding community. Royal Victoria Hospital is one of Barrie’s largest employers along with the City of Barrie. If you have been hurt or injured in a car accident in Barrie, you will likely be treated at the Royal Victoria Hospital. But, given Barrie’s close proximity to Toronto, if the accident is serious enough, you may have to be airlifted to Sunnybrook Hospital in Toronto, which is the main and largest trauma centre in Ontario. Downtown Barrie is picturesque. It’s downtown is located along the waterfront. The downtown core hosts many boutiques, restaurants and pubs. Many of the buildings in the downtown core are in the Victorian style, and have been kept up over the years which adds to Barrie’s charm and popularity amongst locals and tourists alike. Barrie is also the host to numerous festivals in the downtown core including but not limited to Winterfest, Barrielicious and the Barrie Film Festival. Barrie has been seen as a commuter City for people who work in Toronto, but live in Barrie. There are large employers in Barrie, but many people who live in Barrie take the 400 Highway to work in Toronto every day. The cheaper housing prices and more laid back lifestyle which Barrie has to offer makes this an attractive option for many. Around one third of Barrie’s workforce commutes to Toronto for work. Barrie is also close to many ski and popular recreational resorts such as Blue Mountain, Mount St. Louis Moonstone and Horseshoe Valley Resort. If you or a loved one has been hurt or injured in a car accident, or brain injured, or traumatically injured as a result of an accident in and around the Barrie area, don’t hesitate to contact Injury Law today for your free consultation with a personal injury lawyer. If you are too hurt to visit us at our office, we would be pleased to visit you in Barrie or in the surrounding area at your home or at hospital. All of our consultations are free, and we send a personal injury lawyer to all of our consultations. You can reach us toll free at 1-877-730-1777 or by email at info@goldfingerlaw.com. 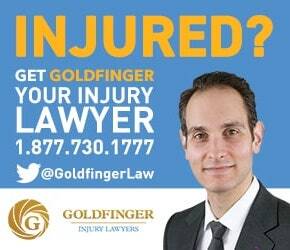 The team at Goldfinger Law looks forward to assisting you as best as we can with your personal injury law case.